It's one thing to go to a play and see a bunch of actors tell a story. It's another thing to go to a play and see a bunch of non-actors tell their own stories. 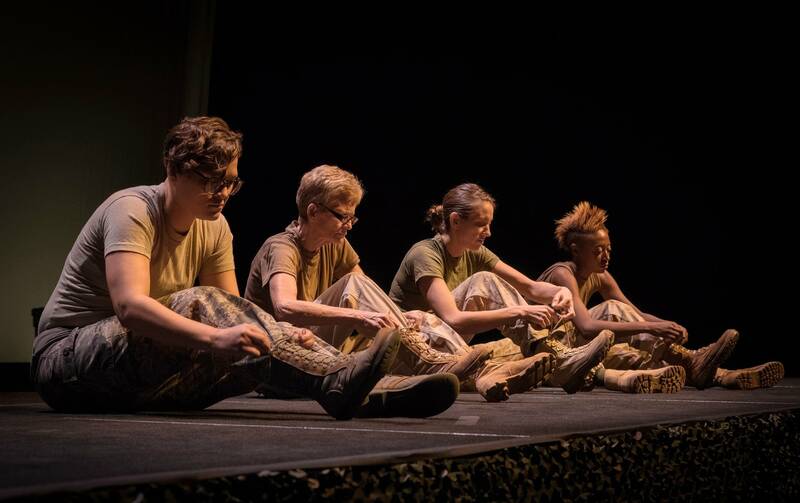 Especially when those stories are as powerful and authentic as those presented in "She Went to War," playing through Sunday at the Guthrie Theater's Dowling Studio. The four cast members of "She Went to War," a production of The Telling Project, are all military veterans. All served in Iraq or Afghanistan (although one of them also participated in conflicts going back as far as Grenada in 1983 and the action that deposed Panama's Manuel Noriega in 1989). As the show's title suggests, all four veterans are women. And despite the "exclusion policy" supposedly in effect until recently, all have served directly in harm's way. Their experiences ranged from deadly dull to just plain deadly. "They didn't know what to do with us," one tells the audience. "It was very awkward. It was as if they were trying to build the plane and fly it at the same time." "She Went to War" has no ideology but a clear-eyed sense of purpose: that of educating civilians about the experience of women in combat zones. To that end, it curates the real stories of these four veterans and cobbles them together into an hour-long performance. If an interlocking series of monologues sounds tedious, it's not. Consider the story of Sgt. Jenn Calaway, who served as a Marine journalist in Afghanistan. She was shooting video at the moment that an Afghan officer tripped an improvised bomb. After the explosion, she spotted a bit of the officer's remains on her uniform. To her lasting embarrassment, she responded as a non-Marine might have: "Ewww!" "Who says 'ewww' in a combat zone?" she asked the audience. The monologues give way to moments of ensemble acting: One counts cadence and the others march; one yells "Incoming" and they all dive for safety; one is blown off her feet and the others catch her. The vets describe, and demonstrate, the camaraderie that comes from their shared experience. At times, they look to each other for affirmation. "Boom?" one asks. "Boom," the others reply. The elder of the group, a retired sergeant major named Gretchen Evans, tells the spellbinding story of her close brush with death in Afghanistan. She and the soldiers under her command were forced to retreat up a mountainside, pursued by enemy fighters. They were running out of both real estate and ammunition, stranded at the top, when a helicopter arrived to rescue them. Evans was the last to board. That was her physical rescue. Her emotional rescue came when she'd reached safety, and a soldier brought her a meal, and then sat down and ate with her. "I have spent a lifetime on that mountain," she told the audience. "I'm not so sure there's not still a part of me there."